With a polished stainless steel black finish, and metal accents, the Black Worcester Kettle is the combination of quality design and impressive features.With the rapid boil zone feature, perfect pour spout, 1/2/3 cup volumes and energy saving measures, the Black Worcester Kettle is the perfect choice for the heart of your home. Whether you’re making a cuppa for one or a pot for a few, ensure you boil just the right amount. 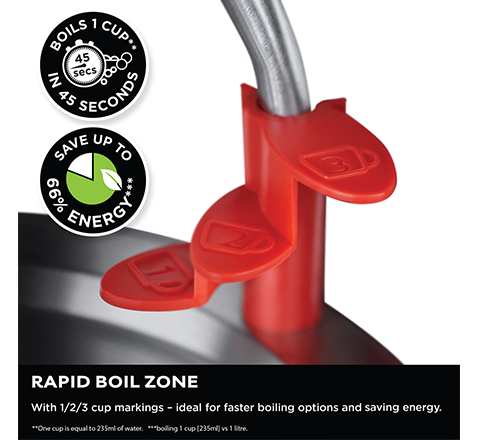 Nobody appreciates half a cup of tea so make use of the of the rapid boil zones using the internal widget that this kettle has to offer. If you’re just treating yourself to a much needed mid-morning cuppa or it’s that necessary morning brew to start the day, boil it in just 45 seconds** and start your day the right way.